Well, it looks like I’m stuck at the Richmond Hospital for another night. The tests show gallblabber stones and the doctor wants to keep me here to run more tests tomorrow to see if I should go into surgery to have the stones remove. Whenever I do or try something new, I’ve always tried to share my experience with you so I figured this is no different. We share the good times and the bad. This is actually the first time that I have ever been hospitalized. Well, this and the day I was born. So far, the experience has been pretty boring. Most of the day is wasted waiting for test results. Then the results usually results in more tests. I’ve always said you can blog from anywhere in the world and I guess this is as good an example as any. 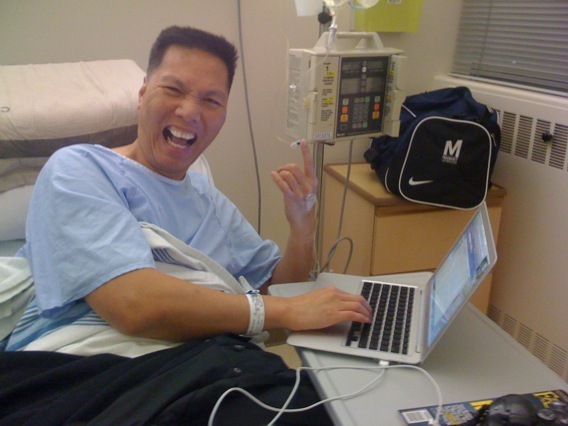 Here’s a photo, taken with my iPhone, of my little hospital blogging setup. I’ve turned my iPhone 3G into a wireless router using PDANet so I can log onto the Internet with my MacBook Air. The Market Leverage bag holds the rest of the mobile blogging gears. The doctors and nurses are completely blown away. 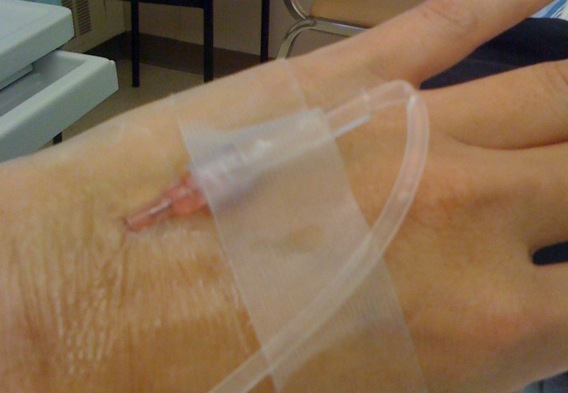 Here’s a photo of the IV needle going into my arm. Since I can’t drink or eat, this is the only thing providing me with any type of nourishment. I’m still hungry as hell however. 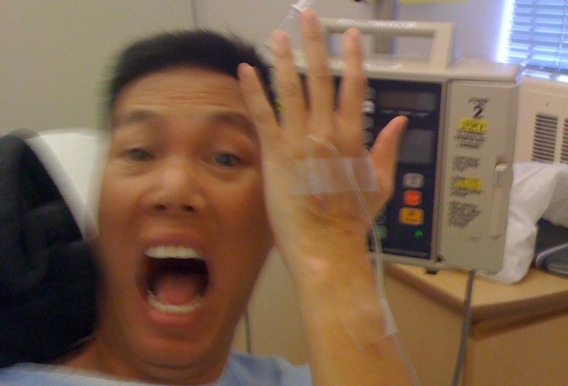 This is my reaction upon seeing the IV stuck in my arm.